Representative Honours: Ireland: 1 Full Cap (1930), Junior; Irish League: 1 Cap (1926); Intermediate League representative. Club Honours: (with Glentoran) Irish League Champion 1924/25; Irish Cup Runner-Up 1922/23, 1924/25; Co. Antrim Shield Winner 1924/25; Charity Cup Winner 1922/23, 1924/25, 1925/26 (shared). Willie Reid made his name with Glentoran during the 1920s, winning a host of honours (though an Irish Cup winner's medal eluded him) and inter-league honours (against the Free State League in 1926). He left Belfast behind in the summer of 1926 to emigrate to the United States where he played, with some success, for Bethlehem Steel in the ASL. An imposing centre-half, Reid spent over a decade with Hearts, playing exclusively in the Scottish First Division. He made his Hearts debut as right-back on 13 April 1927 in a 3-0 Dunedin Cup (a competition involving clubs from Edinburgh and the surrounding area) win over Falkirk. In 1930, when selected by Ireland for a Home Nations match against England at Bramall Lane, Sheffield, Reid became the first non-Scottish Hearts player to win international recognition. His Hearts career came to a close in 1936. He was awarded a testimonial – joint with teammate Sandy Herd – against Chelsea. 8,500 turned up to bid the pair a fond farewell and watch a 1-1 draw. On leaving Hearts Reid returned to Ireland, playing in the League of Ireland with Dundalk. Picture kindly supplied by Jim Murphy. The Reid family originally came from the Riccarton area, near Kilmarnock in Scotland, but moved to Belfast in 1900. Jimmy, John, Max, Davy were born in Scotland while Willie (Bill’s Father) and Bob were born in Ulster. As the brothers themselves got involved in senior football they gradually moved on to England, Scotland, the U.S.A. and Canada. John, also known as Jack, Began with Distillery before a £750 transfer to the now defunct New Brighton in August 1921, aged 23. He spent eight seasons with the “Rakers” before coming back to the Irish League with firstly, Ballymena then Bangor. While with the Braidmen he won an Irish Cup winners medal in 1929 before briefly rejoining New Brighton for a few months and then returning to his roots to complete his career at Distillery again. Originally a centre-forward, he scored twice versus Belfast Celtic in the 1920 County Antrim Shield final before being converted to a centre-half. For the Wirrall men he made over 170 appearances. 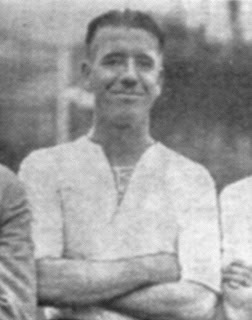 Max Reid, five years older than John, was also a star with New Brighton,making 109 appearances between 1921 and 1927. Indeed the club staged a joint benefit match for them in 1926 when an “Irish XI” took on a“Scottish XI”. Max, an enthusiastic wing-half with a biting tackle, began also with Distillery and returned to local football with Portadown before deciding to try his luck in Canadian soccer. The only brother to gain a full international cap was Willie. Although there is a story that John was invited to a trial match, only for the selectors to later discover his Scottish birth. Willie in his early career was picked for Scotland but when the selectors discovered he had already played for Junior Ireland they had to replace him. Willie began with junior clubs Ulster Rangers and Bloomfield Olympic before going to Glentoran in 1923. He had three seasons with Glentoran, playing 83 times for them and scoring 13 goals. During his Glentoran career he represented both the Irish League and the Irish Intermediate League, but possibly his most important feat with Glentoran was scoring one of the goals in a 2-1 win at Newry which clinched the 1924/25 League Championship. In 1926 Willie also went trans-Atlantic and signed for Bethlehem Steel Works in the American Soccer League Inc. In 1930 Willie returned to Northern Ireland. Glentoran still held his registration and indeed offered him a £50 signing on fee with £4 a week wages. However after a short spell with Willowfield he joined Heart of Midlothian in Scotland. Willie spent seven seasons at Tynecastle (three as captain) and gained his international cap versus England in October 1930 during this spell. In the late thirties he moved across Edinburgh to Hibernian and later back across the Irish Sea to Dundalk. 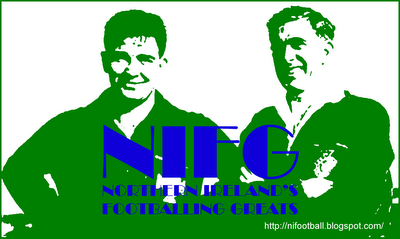 Willie also managed Ballymena United in 1946 when the team started back up after the war. He ended his career with Short Brothers and Harland Antiques. The next brother in question is David, or Davy Reid, He also began with Distillery before joining Everton in the early 1920’s. Davy was called the “best left foot” in the English First Division at outside-left. After a lengthy spell at Goodison hereturned to Ballymena in 1929 before finally becoming Glentoran’s coach in 1934.He also managed Coleraine in the late Thirties. The oldest of the brothers was Jimmy, whose career began before the First World War.He appeared 136 times for Glentoran between 1905 and 1915, but not at all during 1908/9and 1909/10 the period when he was with Oldham Athletic. In the 1920’s Jimmy trained both Glentoran and the Irish League representative team, completing a notable double as he had played for the Irish League against their Scottish counterparts in 1910/11. The final member of the clan was Bob. He was with Cliftonville and Distillery, playing mainly for their Second XI but he too had a spell in U.S. soccer.